Louis Armstrong is synonymous with jazz. One of its first proponents and shapers, his technical superiority, spontaneity, and creativity gave life to the music and influenced everyone that came after him. He grew up in New Orleans where he learned to play cornet in reform school and absorbed all of the music around him in the port city. He played around New Orleans in several bands and joined “King” Oliver’s Creole Jazz Band in Chicago in 1922. In 1925 he recorded his famous Hot Five and Hot Seven sessions. 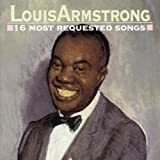 Armstrong was a frequent guest on TV specials and made two dozen films, one of his most charming with Bing Crosby and Frank Sinatra, High Society (1956).